So writes the Macro Investor in edited excerpts from his most recent post* on Seeking Alpha entitled S&P To 1872 From Quantitative Easing. [As mentioned in the opening paragraph,] I find it a bit surprising that no one is talking of the single largest driver for stocks in the past 4 years – massive monetary base expansion by the Fed [see chart below]. To estimate [the affect of the] monetary base expansion on the S&P 500, I did a simple calculation. 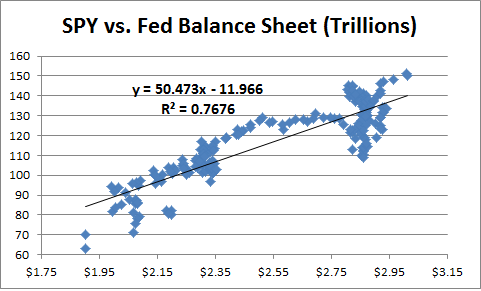 Projecting the monetary base in the future is tricky, so I took the Federal Reserve Balance Sheet as a proxy. 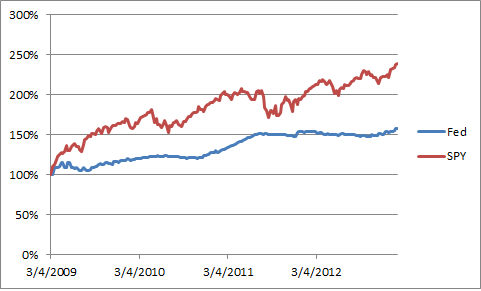 I plotted the S&P 500 against the Fed’s Balance Sheet on a weekly basis since the market bottom on March 2009 [see chart below]. From the [above] chart, it is clear that the Fed’s balance sheet is a good proxy for the monetary base [so] I ran a regression model [see chart below] to see how the S&P 500 has changed with the Fed’s balance sheet. The R2 at ~77% is pretty high, which means that 77% of the price movement in the S&P 500 can be explained by changes in the Fed’s balance sheet…. a end year 2013 value of SPY of ~187, or a S&P 500 of ~1872, which means a 25% increase from current levels. which means a 60% increase from current levels by end of 2014. [The above] may seem like big increases, so let’s cross check this with historical P/E ratios. Even if earnings were to be flat for the next 12 months, at 1872, S&P 500 will have a backward looking P/E of 19. If earnings were to increase by 5%, backward looking P/E would be 18, and if they were to increase by 10%, backward looking P/E would be 17. As a comparison, the last time the S&P 500 was at 1500, the backward looking P/E was 17.6 so these numbers are not unrealistic at all. How can an investor profit from this trend? Today, I bought January 2014 strike 115 calls on the 3x leveraged ETF on SPY (UPRO) for $11.5. If the S&P increases by 12.5% from this level (half of the predicted 25%), then UPRO will end the year at ~140. This will mean about 120% return on the calls in a year. Breakeven will require about 7-8% increase in the S&P 500, which I expect to come before summer. This market, fueled by massive amounts of liquidity being pumped by the Fed, has legs. 4. What Recovery? Contradictions Between Reality & Political Claims Are Everywhere! 5. 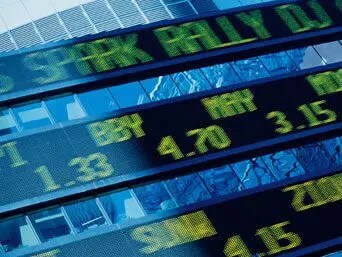 Ignore Wall Street Cheerleaders: Market Technicals, Fundamentals & Other Info Says Otherwise!